Professor Marshall was awarded a Bachelor of Science with 1st Class Honours in zoology from the University of St Andrews, Scotland in 1985. He completed a Doctor of Philosophy in Neurobiology in 1991 at the University of Sussex, Brighton, researching vision in mantis shrimps. Professor Marshall continued at the University of Sussex until 1996, when he took up a position in the Vision Touch and Hearing Research Centre within the School of Biomedical Sciences at The University of Queensland. He was recruited to the Queensland Brain Institute in 2010. The recipient of many grants and awards, most recently in 2011 Professor Marshall was awarded The University of Queensland Vice-Chancellor’s Senior Research Fellowship and in 2014 he was awarded an Australian Research Council Laureate Fellowship. His research is funded by the Australian and United States funding agencies. Professor Marshall’s principle aim is to understand how other animals perceive their environment. As arrogant humans we tend to assume we are the pinnacle of evolution, however, certainly in sensory terms this is far from true. By taking an approach to sensory systems which is based around ecology but also includes physiology, anatomy, behaviour and neural integration, he hopes to decode languages such as colour and polarisation. 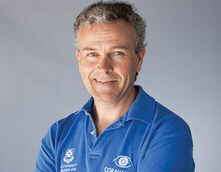 Much of his work focusses on the marine environment, in particular reef systems and the deep-sea. As part of this effort he has become acutely aware of man’s influence on both these environments and now run two projects / organisations: The Deep Australia Project, bringing research submersibles and high-tech deep-sea capability to Australia for the first time and CoralWatch, the world’s largest citizen-science-based coral health assessment program (60 countries, 10 languages). 200 + papers (5 in Nature, 3 in Science, 10 in Current Biology) 30+ chapters / reviews and 2 edited monographs in sensory neuroscience. 2 books, 5 edited books, 200+ conference papers and abstracts. Cronin, Thomas W., Johnsen, Sonke, Marshall, N. Justin and Warrant, Eric J. Visual Ecology. Princeton, NJ United States: Princeton University Press, 2014. Reid, Craig, Marshall, Justin, Logan, Dave and Kleine, Diana Coral Reefs and Climate Change 1 ed. Edited by Craig Reid Brisbane: The University of Queensland Press, 2009. Sensory Processing in Aquatic Environments. Edited by Shaun P. Collin and N. Justin Marshall New York: Springer, 2003. Kremers, Jan, Baraas, Rigmor C. and Marshall, N. Justin (2016). Preface. In Kremers, J, Baraas, RC and Marshall, NJ (Ed. ), Human Color Vision (pp. V-VI) Cham, Switzerland: Springer Nature. Marshall, Justin, Collin, Shaun, Hart, Nathan and Bailes, Helena (2016). Vision in lungfish. In Jorden Morup Jorgensen and Jean Joss (Ed. ), The biology of lungfishes (pp. 447-476) Boca Raton, FL, United States: CRC Press. Horvath, Gabor, Collin, Shaun and Marshall, Justin (2014). Polarized Light and Polarization Vision in Animal Sciences: Preface to the Volume. In Polarized Light and Polarization Vision in Animal Sciences (pp. VII-XI) Berlin, Germany: Springer. What does a reef fish see when sees a reef fish? Cronin, T. W. and Marshall, N. J. (2004). The unique visual world of mantis shrimps. In Frederick R. Prete (Ed. ), Complex worlds from simpler nervous systems 1 ed. (pp. 239-268) Cambridge, Massachusetts: Massachusetts Institute of Technology Press. Collin, S. P. and Marshall, N. J. (2003). Preface. In Shaun P. Collin and N. Justin Marhsall (Ed. ), Sensory Processing in Aquatic Environments (pp. vii-iX) New York: Springer-Verlag. Marshall, J. and Vorobyev, M. (2003). The Design of Color Signals and Color Vision in Fishes. In S.P. Collin and N.J. Marshall (Ed. ), Sensory processing in aquatic environments 1 ed. (pp. 194-222) USA: Springer. Marshall, N. J., Cronin, T. W. and Frank, T. M. (2003). Visual Adaptations in Crustaceans: Chromatic, Developmental and Temporal Aspects. In S. P. Collin and N. J. Marshall (Ed. ), Sensory processing in aquatic environments 1 ed. (pp. 343-372) New York; Berlin: Springer. Marshall, J. (2000). The Visual Ecology of Reef Fish Colours. In Y. Espmark, T. Amundsen and G. Rosenquist (Ed. ), Animal Signals 1 ed. (pp. 83-120) Trondheim, Norway: Tapir. Douglas, R. H. and Marshall, J. (1999). A review of vertebrate and invertebrate ocular filters. In S. N. Archer, M. B. A. Djamgoz, E. R. Loew, J. C. Partridge and S. Vallerga (Ed. ), Adaptive mechanisms in the ecology of vision (pp. 95-162) UK: Kluwer Academic Publishers. Marshall, J., Kent, J. and Cronin, T. W. (1999). Visual adaptions in crustaceans: Spectral sensitivity in divers habitats. In S.N. Archer, M.B.A. Djamgoz, E.R. Loew, J.C. Partridge and S. Vallerga (Ed. ), Adative Mechanisms in The Ecology of Vision (pp. 285-327) UK: Kluwer Academic Publishers. Do not be distracted by pretty colors: a comment on Olsson et al. Cronin, TW, Marshall, NJ and Caldwell, RL (2000) Spectral tuning and the visual ecology of mantis shrimps. Philosophical Transactions of The Royal Society of London Series B-biological Sciences, 355 1401: 1263-1267. Cronin, T. W., Marshall, N. J. and Land, M. F. (1994) The unique visual system of the mantis shrimp. American Scientist, 82 4: 356-365. Thoen, Hanne H., Strausfeld, Nicholas and Marshall, Justin (2017). Pathways underlying colour and polarisation processing in stomatopods. In: Annual Meeting of the Society for Integrative and Comparative Biology (SICB), New Orleans, LA, (E429-E429). 4-8 January 2017 . Johnsen, S., Gagnon, Y. L., Marshall, N. J. and Cronin, T. W. (2016). Another beautiful hypothesis slain by an ugly fact: Polarization vision does not increase the sighting distance of silvery fish. In: Annual Meeting of the Society for Integrative and Comparative Biology (SICB), Portland, United States, (E103-E103). Jan 03-07, 2016. Kleinlogel, S., Marshall, N. J. and Collin, S. P. (2005). A Crustacean Retina with 12 Spectral and 4 Polarization Sensitivities. In: Abstracts of the Society for Neuroscience 2005. Society for Neuroscience Annual Meeting 2005, Washington, (). 12-16 November, 2005. Marshall, N. J., Collin, S. P., Hart, N. S., Vorobyev, M. and Bailes, H.J. (2004). The visual ecology of the Australian lungfish Neoceratodus Forsteri. In: Paul Martin, Abstract in the Proceedings of the Australian Neuroscience Society. Australian Neuroscience Society Meeting 24th Annual Meeting, Melbourne Convention Centre, Melbourne Australia, (21-21). 27-30 January. Bailes, H. J., Trezise, A. E. O., Marshall, N. J. and Collin, S. P. (2004). The visual system of an ancient vertebrate: the Australian lungfish Neoceratodus forsteri (Krefft 1870). In: Paul Martin, Abstract in the Proceedings of the Australian Neuroscience Society. 24th Annual Meeting of the Australian Neuroscience Society, Melbourne, Australia, (83-83). 27-30 January 2004. Marshall, N. J. (2000). Communication and camouflage with the same 'bright' colours in reef fishes. In: , , (1243-1248). .
Marshall, J., Land, M. F., Cronin, T. W., Shashar, N. and Oberwinkler, J. (2000). Simulataneous sexichromatic UV vision and 3D polarisation vision: Mantis Shrimps again!. In: Second Workshop on Ultraviolet and Polarization Vision. Second Workshop on Ultraviolet and Polarization Vision, University of Victoria, Victoria, British Columbia, Canada, (20-20). 20 - 24 June, 2000. Marshall, N. J. (1996). The lateral line systems of three deep-sea fish. In: , , (239-258). .
How does coral reef bleaching affect coral reef fish? Biological Polarisation Signals: Environment, Function and Structure. What does a fish see when it sees another fish? Underwater colour vision and colour communication. Fluorescent plumage in birds: Signal or by-product?